Drinking fountains were often combined with lamps – no point in having a fountain if you can’t see it in the dark! The lamps of these multi-use structures can be found within canopies and also as a lamp pillar atop fountains and horse troughs. The erection of ornate, decorative drinking fountains was prevalent in Victorian times and to a lesser degree in the Edwardian period. Initially, light was provided by gas until electricity became more commonplace during the early 20th century. 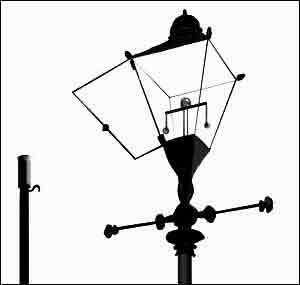 The bars near the top of the lamp(s), called yoke maintenance arms, supported the lamplighter’s ladder. Once up the ladder, he opened a hinged pane of glass. With his pole which contained a spirit lamp, he used the hook at the top of the pole to tug on one of two chains, which hung within the lamp. One chain engaged the supply of gas and the other closed the gas supply. When the gas was lit, it made a popping sound. The flame from the lighted gas heated a mantle which became incandescent and gave out light. When the mantles needed replacing, the light flickered so that shadows seemed to move. Gas mantles were made from a material that looked like fine honeycombed silk and were extremely fragile. Once they had been heated, they crumbled very easily. Shortly after the Second World War clockwork timers were installed in street lamps which allowed the light to come on and off automatically. This new invention meant the extinction of the lamplighter profession. However, maintenance of the lamps, and winding of the clock mechanism, was needed periodically and still required the use of a ladder. O Leerie, I’ll go round at night and light the lamps with you. O Leerie, see a little child and nod to him tonight.